Styled with lux t-shirt . 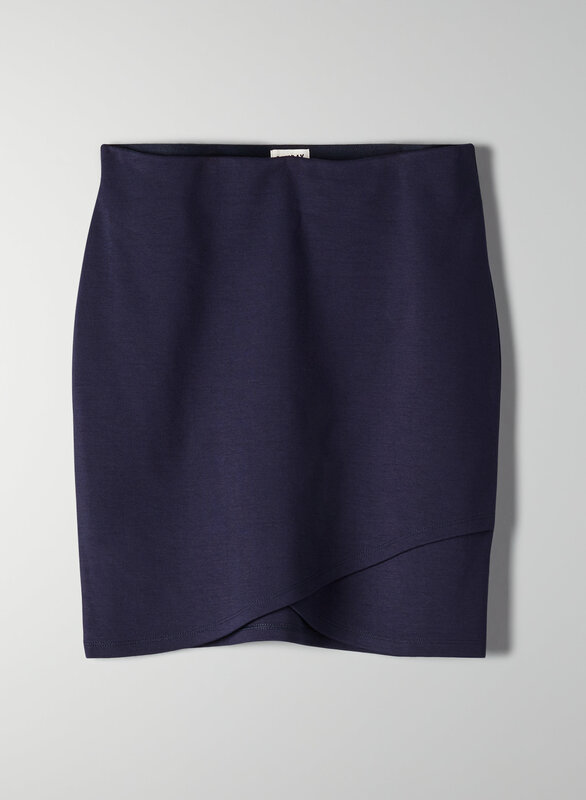 This is a faux-wrap skirt with an asymmetric front and pull-on silhouette. It's made from a stretch ponte that hugs you in and keeps its shape all day. I have this skirt in three colours . It’s a great go to ! I got one size up only because I don’t like anything tight on waist . I own this in so many colours, it's the right length and very comfortable. It really hugs your curves and cinches in the waist nicely. It's a stretchy material so I would size down. I usually avoid tight skirts due to my pear shaped figure, but the thicker material of this skirt makes it super figure-flattering. I bought this skirt a while ago in black, and purchased it again in red. It’s really cute and can be casual or formal. After walking it does move up a lot, though.